Mercury stations retrograde at 1:44 am on 19th May GMT, and remains in its own sign, Gemini, throughout its retrograde passage. Practically speaking, this is an inquisitive Mercury, seeking information and answers, reviewing events of the past three months, wondering about relationships and connections with others and generally taking stock and sorting through unfinished business. It efficiently clears the decks of outstanding matters, enabling positive progress in the months to come. Of course, that also means current misunderstandings will need to be addressed in the coming weeks whether we like it or not! It may be a hassle at the time, frustrating our desire for progress, but if we commit to sorting through the chaos and getting things back on track now we’ll make up what felt like lost time, in due course. If, however, we try to battle on, ignoring the increasingly obvious signs that something somewhere is going awry, we can be absolutely certain that once Mercury turns direct again we’ll wish we’d listened better to its warnings and done what was needed back then! Mercury’s retrograde station occurs opposite The Great Attractor. This anomalous point in space is the ultimate in seduction, drawing us towards and beyond it whether we like it or not. The Great Attractor reminds us that in a world of infinite possibilities all things must both repel and attract each other at some point in their cycle of becoming. Just as children can be repulsed by foods they enjoy as adults, and the ‘love of our life’ can become our most ardent enemy when the tides of passion turn, the existence of polarity is central to the very nature of being. We must know the extremes to find the balance that allows wholeness, entertain possibilities that before seemed too outlandish to be true, discard what once meant the world to us and be prepared to release even the very facets of our nature that previously made us who we are. The Great Attractor is our portal to the future, born of the deepest contradictions which may paralyse us in the present. We cannot resist The Great Attractor (hence its name!) but we can surrender to its intensity of extremes, allowing its contradictions and profound paradoxes to penetrate our every cell until we know them as the very tension which animates life itself. In its darkest depths we encounter fate, those things we simply cannot change, a certain quality of being we cannot escape. Mercury’s opposition to this point as it turns retrograde poses the question ‘What do we do when we can’t change a thing? What does it mean to live a life shaped by powers beyond our reckoning?’. Whilst the practice of astrology reveals the deeply creative role we have in the weaving of our life’s fabric, The Great Attractor reminds us we are still the tiniest pin prick on the surface of a relatively small planet in one of hundreds of solar systems swirling through infinite space! Sometimes, it reminds us, life just does what it does, unfolds as it must and we simply have to deal with it! It may all sound rather negative and resigned: not what we want to hear. Which is precisely the point. The very fact we don’t want to hear it is why Mercury is shouting it loud and clear right now: there is still so much we simply don’t know. Infinite knowledge is not in our grasp. 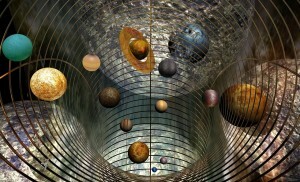 We are not the architects of this awesome universe but instead a small part of it. As much as we yearn for control, the heavens remind us now some things are simply beyond our authority and wasting time and energy trying to influence them may have caused us to take our eye off the ball in recent months. Time now to get to grips with what is rather than what we think should be, especially when it comes to relationships. In the coming weeks Mercury highlights what we simply cannot control: responses received from others; decisions made by those we love which turn our world upside down; misunderstandings which seem to arise out of ‘thin air’ simply because you and I are two different people; dynamics sensed immediately upon meeting someone which bear no ‘rational’ explanation: ‘you creep me out’, ‘I like you’, ‘I want to get to know you better’, ‘I hope our paths never cross again’. All point to the unavoidable consequence of life doing what it does: the interplay of our energy with that of another, creating outcomes beyond our control. No matter how hard we try to elicit the result we want – tying ourselves in knots of avoidance and denial in the process – there are no guarantees. Life now calls for living truthfully in the present, not with guile to create an imagined future. Speak the truth. Say it as it is and make doing that our purpose, no matter the outcome. Contrary to popular belief about power and powerlessness, recognising the limits of our own influence is profoundly liberating. In doing so we can simply stop trying to shape what refuses to be moulded by anything other than its own nature. There is a deep and nourishing peace at the heart of The Great Attractor when we simply allow it to draw us in and have its way. For its way is our way eventually. Through our very acceptance of what we cannot change we become a living, breathing reflection of the creator spirit, not resisting its expression but accepting it as a force of greater intelligence than the ‘little me’ who always thinks it knows best. Once aligned with fate as an active participant there is nothing we cannot be or do, for all that is asked of us is who and what we already are. This current period of Mercury retrograde will reveal much about what we can change and what is simply the fundamental nature of life, of ourselves and other people. By its end we will know what is and isn’t up for debate. We may well feel resistant to this revelation, but resistance doesn’t mean we’re right and the universe needs to shape up and get with the programme! It means we’re being too small in our outlook, too confident of our power in a cosmos which unfurls constantly, revealing ever deeper recesses of infinite space. There is still SO MUCH for us to know. We are mere ‘new borns’ in the infinity of creation. Only in celebrating that fact can we be open enough to receive ever more profound revelations of truth when it is time. The burgeoning Age of Aquarius is not the destination, the culmination of aeons of development, it is merely a way-station on an endless journey of becoming, a revelation of a new way to live and love, a new mode of existence. In cosmic terms it is still a lower rung of a very long ladder stretching into endless space about which we know next to nothing. Being alive at the shift of ages can lead us to believe we have arrived. In fact we are still on the starting blocks, preparing for the off in a very long race. The Great Attractor polarises all things, including ourselves. It offers the objective and subjective and bids us choose which perspective we prefer. Either way the opposite is also true. Behind all of this polarity lies the future, born of the creative tension of opposites and similarities interwoven throughout our lives. As Mercury travels retrograde in the coming weeks we have a chance to view those polarities, to encounter paradox and contradiction, different perspectives in the same space of one relationship and honour them for what they are: the fertile seeds of the future, not problems to be resolved into beige blandness of a uni-dimensional view. If we’ve swept discord under the carpet, said ‘yes’ when we felt ‘no’, committed ourselves when our spirit yearned for freedom, now is the time to do the opposite and reveal the truth. But in doing so we must accept that the choices we make may have consequences we cannot control. Each decision carries its own power, unleashed when we make it, thrust forth to live a life all of its very own. This is how doing the ‘right’ thing can sometimes ‘backfire’ and doing the ‘wrong’ thing can get us exactly where we need to be. The power to choose is ours, then the roller- coaster begins, fuelled not only by our own desire, but also that of the universe: the force of becoming which propels our lives through time and space in ways we have yet to understand. The future is born of each moment. We are its creators and its subjects, thrown hither and thither by influences beyond our control. Such is the paradox at the heart of the human condition: we have enormous creative power but may lack influence over our creation. This is The Great Attractor at work, offering the freedom of self determination with no guarantees. As Mercury retrogrades through Gemini their combined power invites us to claim our creative potential, exercise it with integrity and in doing so know that what will be will be. The most precious goal is simply to honour who we are in the moment and share ourselves honestly with life. The present moment is all we have and living it well is the best we can do. The future isn’t ours to shape but to embrace as it arises, secure in the knowledge that we rest in the arms of life itself, cradled in an infinite universe born of its own design.